We visited Yufuin in Kyushu area. 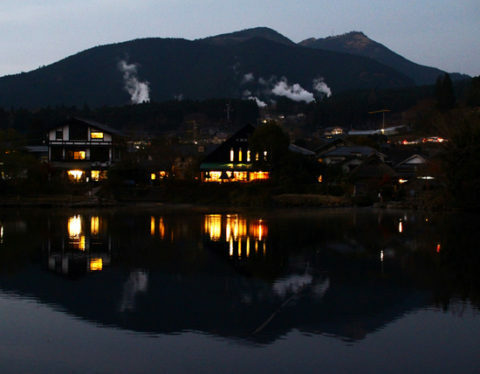 Ample supply of the hot spring, “Yunotsubo street” bustling with the strolling people and the nature including Mt. Yufu are the seductions of the town of Yufuin. The prosperity of the town is created by the people of the town with overcoming the crisis they faced, building a dam with sinking the town itself and large-scale development of the town. They tried to make Yufuin as a health resort where people can really making themselves at home not by a large scaled development but by preserving the nature and scenary of the town. Another important feature we noticed is the old established Japanese style hotels and relatively new hotels with dismantled, reconstructed and renovated old Japanese style houses are forming certain atmosphere and give certain gravity to the whole town. We are assuming this gravity is playing a huge role of the constitution of the town. I remember that once a Japanese old actor said, “The essential beauty of the Japanese culture is not appearing in physical shape but existing in something we cannot see.”. There is no iconic mountain like Mt. Fuji, or iconic village like Shirakawa-go in Yufuin. The charm of this town is also not appearing in such shape but would be existing in something we cannot see. We are feeling so every time we remind the days we spent in Yufuin. The memory of those days are colored by warm hues and joy.